Basketball matches are technically quite short, with National Basketball Association (NBA) matches scheduled for 48 minutes across four quarters of 12 minutes. However, with fouls, timeouts, a 15-minute halftime and the ball going out-of-bounds, games can often last between two to two-and-a-half hours. As a result, the moderate intensity over a shorter period is altered by stoppages that can require relatively unique management of your diabetes. There are quite a few basketball players to note who have played professionally with type 1 diabetes, including Adam Morrison. Morrison won the 2006 Chevrolet Player of the Year award and two NBA championships playing for Los Angeles Lakers. Chris Dudley also played in the NBA, but is now retired, while Gary Forbes is currently a free agent having played for Denver Nuggets and Toronto Raptors. Devising a routine is advised for regular basketball players, with a healthy meal and medication plan allowing for better control of your diabetes. This may require some trial and error in regard to insulin dosages at first, but basketball is a sport that can be quite easily managed once a routine has been established. Reducing your long lasting insulin is not essential for training or playing a game of basketball, however often you play. A routine of eating a balanced breakfast where you can accurately count carbohydrates and know how your body reacts is the best way to start a game day. This can also be applied to your lunch and tea, depending on what time you play. However, this may not apply if you are playing basketball for non-professional game durations or you sit out for most of the game. Ensure your blood sugar is at a comfortable range, somewhere between 7-9 mmol/l before you start playing and have plenty of sugar at your bench area. For every timeout, your blood sugar should be tested, with this opportunity rare in its frequency when compared to most sports. Testing can be carried out regularly through a game, and will give you an idea of how your blood glucose levels react throughout the game. Top-ups for low blood sugar can be accounted for with sips of sugary drinks or carbohydrate snacks, however, adrenaline can result in your blood sugar levels rising. In this case you can inject a small dose of quick acting insulin. It is good practise to try and keep your blood sugar stabilised between the same levels as you started when you reach half time. After the game, your aim should be to have your blood sugar at a comfortable level, somewhere around 7 mmol/l. A good meal should then be taken. You could consider reducing the amount of your next long-acting dose of insulin to prevent hypos later in the night. This can be discussed with your doctor prior to playing. Blood sugar levels can spiral down following periods of exercise, so additional testing will be necessary during the evening and right before bed. You should also remember to take special care of your feet when exercising. Your choice of basketball trainers should be comfortable. 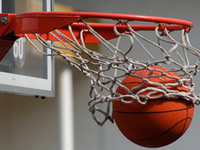 Most professional basketball players with diabetes detach their pump before playing, which is advised for this sport. The Diabetes Forum have previously discussed issues with their diabetes when playing basketball.